As a professional photographer Katerina Krjanina has years of experience working with Families, Kids, Newborns, Modeling Agencies, Models, Actors and Talents, Brides and Grooms, Corporations and Companies. Her photography career began more than 15 years ago in Europe. Katerina Krjanina has more than 10 years’ experience working as a wedding photographer in United States, Latin America and Europe. Great skills, experience and communication helps Katerina Krjanina provide outstanding wedding photography services to every bride and grooms she works with. As a mother of 5 adorable kids’ Katerina Krjanina loves working with newborns, kids and families. She does lovely Newborn photographs and offers Family photography sessions. For women who are expecting Katerina Krjanina offers beautiful Maternity photography sessions. Headshots and Portraiture photography is a field where Katerina Krjanina likes to offer her photography services as well. Katerina Krjanina provides great quality headshots and portrait photography services for actors, models, lawyers, doctors, real estate agents, and people in business. Katerina Krjanina owns a few photography studios in Florida. One of them is a Photography Palm Coast Studio and was founded in year 2014. On location studio based in the city of Palm Coast Florida. Photography Palm Coast Studio provides high quality photography services in Palm Coast and areas around including Bunnell, Flagler Beach, Hammock Beach, Saint Augustine, and Jacksonville City. Wedding Photographer Palm Coast Studios owed by Katerina Krjanina Photography provide luxury wedding photography services to Brides and Grooms in all state of Florida. Wedding photography studio and Katerina Krjanina offer lovely engagement photography sessions for couples who are planning to get marriage or just want to have their love story captured by engagement photographer Katerina Krjanina. As an engagement photographer Katerina has passion and experience to capture small memorable details during the session. Katerina Krjanina works as a Boudoir photographer since 2008 and considered as a professional female boudoir photographer. Being a woman helps her to provide to every client photographs she is looking for. Katerina is a Katerina Krjanina Photography & Videography and Photography KJ Studio head photographer and digital image editor. Photography KJ Studio was established in year 2008. Until now Photography KJ Studio and Katerina Krjanina Photography provide professional photography services to people in Florida and around. Photography KJ Studio and photographer Katerina Krjanina offers her services in United States, Latin America and Europe. As an award winner photographer Katerina Krjanina is an Event and Show photographer in many projects including Europe and U.S. Katerina Krjanina offer her professional photography services as an event, show and corporate photographer. 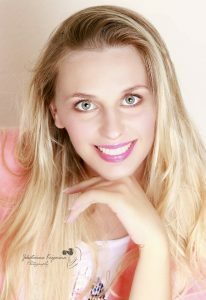 For clients convenience Katerina speaks English, Spanish, Russian and Latvian language.